Hit the hoop is an inclusive activity that encourages players to try different sending techniques, reflect on the results and change if necessary. Divide your players into groups of 4. Using a hoop as a target, place it onto a fence, wall or hold out at chest height when standing. Set out markers cones at distances of 5, 8 10 and 12 metres. Each player in the group has a ball and starts at the 5 metre mark then throws at the target hoop registering 1 point per target hit. Each player will have 3 throws at each distance, only retrieving the balls after all players have thrown. Set a target and compete in teams. 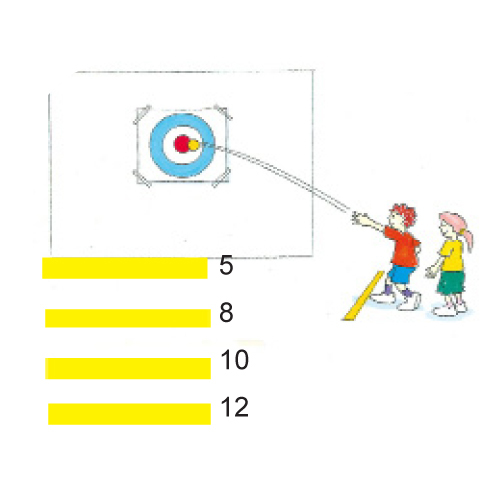 Aim for the smallest number of throws to hit each target or the most number of targets hit in a certain time. Why is it hitting a target so important? Where should we be looking when we are throwing the ball? What method of gripping the ball is the most successful?